In this 4-day getaway, Cambodia Tours introduces you to country’s key destinations: Phnom Penh and Siem Reap. Start in the bustling capital, learning about Cambodia’s recent history then drive north to Siem Reap and discover the entrancing beauty of the ancient Angkor Temples. Price from: $305 - Book now! Visiting Khmer countryside and meeting with local people. Welcome to Phnom Penh- the Capital of the kingdom. The city was founded in the 14th century and has long been a vital trading hub at the confluence of three rivers: the Mekong, Tonle and Bassac. Upon arrival, you will be met by your local guide who then transfers you to the hotel for check in. In the afternoon, you will explore the city key sites, first with the National Museum—a perfect introduction of the ancient Khmer art and civilization. Then, go to the Royal Palace, home to the royal family and the opulent Silver Pagoda. Browse in the Russian Market before driving to the dock to catch an evening boat cruise along the Mekong River. Savor a welcome dinner on board as you watch the sunset over the shimmering lights of Phnom Penh. Enjoy your breakfast at the hotel followed by a half day historical tour to the Tuol Sleng Genocide Museum and the notorious Choeung Ek “Killing Fields.” In spite of the recent turbulent history and crimes by the Khmer Rouge, the post- war Cambodian have been rebuilding their Kingdom, healed up the nation for the brighter future. After having lunch in Phnom Penh (your own account), hop on a 5 hours shuttle bus to Siem Reap. 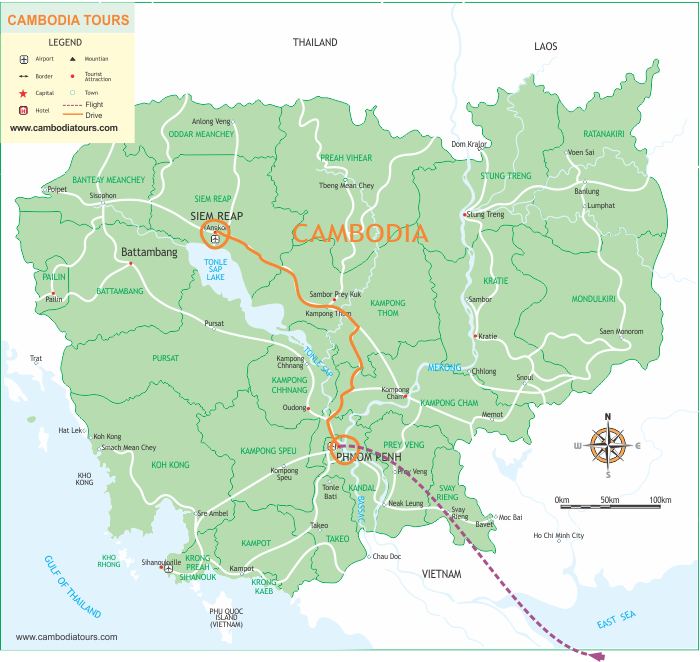 The journey offers an excellent opportunity to observe the rural Cambodia up-close. On arrival in Siem Reap which is best known as the provincial capital and gateway to the ancient Angkor temples, check in the hotel and you are then free at your leisure or explore the Psar Chass - the “Old Market” for some souvenir shopping or have some drinks at Pub Street. If you wish to travel by flight instead, a surcharge of US$ 80.00 per person will be applied. For the early birds and photographers, we offer Angkor Wat sunrise tour. This takes place from 4.30 AM to 6.00 AM so you will need wake up early to be transferred there by tuk tuk. Afterward, you will be back to the hotel for the breakfast. After breakfast at the hotel, hop on the car heading to the South Gate of Angkor Thom which is famous for its majestic doors and artifacts followed by the visit of monumental temple of Bayon facing the tropical forest and Baphuon and Phimeanakas Mountains. Later, visit the Elephant Terrace, Terrace of the Leper King and Takeo "Jewel of Crystal", which is dedicated to the Hindu God Shiva and was erected at the end of the 10th century. You won’t miss Ta Prohm Temple, which is a wonderful combination of human genius and natural beauty with its giant trees that have grown there for centuries. In the afternoon, visit Angkor Wat, the UNESCO World Heritage Site, which was constructed by Suryavarman II who reigned Cambodia from 1113 to 1152 and built the five towers in the 12th century and dedicated them to the Hindu God Vishnu. The plan of the Pyramidal conception of the temple combined with spaces, alleys and ditches is an ancient masterpiece of the architectural design and construction. Return to your hotel later this afternoon and spend your rest of time at leisure. Enjoy your breakfast at hotel, then transfer to discover Tonle Sap Lake which is the largest freshwater lake in Southeast Asia and flows into Tonle Sap River, joining the Mekong in Phnom Penh. On arrival, embark a boat to cruise to a “floating village” for the best local touch. Next, transfer out to the Siem Reap airport for your departure flight home.